PS - the second picture was a huge layout in the Boston Globe. Murphy and Dwyer can be seen fairly easily. Bain can also be seen in this version. Lots of great pix on their website. You can just barely make out my sunglasses in the first picture. 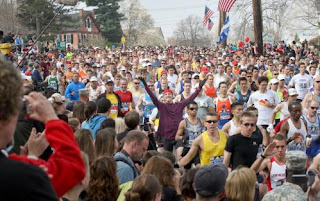 The rest of the pix are from MarathonPhoto. Wow. I feel like I was there! I love how you've captured that feeling of detachment from reality you experience while running a marathon. It's almost another state of consciousness where you don't need words to communicate with other runners. And the irrational rage you feel towards people who are cheering and cooking burgers, seemingly harmless activities- I think we've all been there. Thanks for sharing your experience with us, Jake. Excellent review, Jake. I was dying laughing at some of your comments as I read this. You've said you probably won't do another marathon, but I think one day you will want to. If anyone needs to kill more time reading and wants to know what the next challenge is, read this. A deafening symphony of estrogen soon surrounded us. I never thought people could be so in touch with every moment. I just run the thing and have fun. I don't even wear a watch or do much analysis of mile splits and such. I am a bit surprised you wanted the crowds to leave you alone, though. Terrific prose Klim...you captured the enormity of the event from a unique and intimate perspective like no other. I never said I would NEVER run one again...or at least I didn't mean to. I am DONE with marathons for the next 5 years or so. I want to concentrate on breaking 15 for the 5k and lowering my times in 13.1 and below. In order to do this I need to work on my turnover speed while maintaining similar mileage. I am getting old and soon I won't be able to PR in things like the 5k anymore...so it's time to have fun.